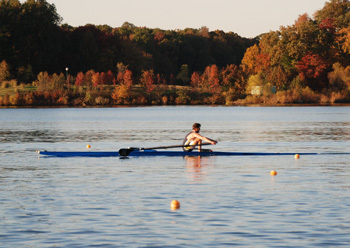 If you are new to the sport of rowing, this Guide will give you the basics. Events are divided into two disciplines: sweep rowing and sculling, and two categories within those: lightweight and open. Rowers can also be categorized by age: Juniors, Under-23, Open and Masters. Athletes with two oars – one in each hand – are scullers. There are three main sculling events: the single – 1x (one person), the double – 2x (two) and the quad – 4x (four). Occasionally a regatta will have an 8x (octuple). Athletes with only one oar are sweep rowers. Sweep boats may or may not carry a coxswain (pronounced cox-n) to steer and be the on-the-water coach. In boats without coxswains, one of the rowers steers by moving the rudder with his or her foot. Sweep rowers come in pairs with a coxswain (2+) and pairs without (2-), fours with a coxswain (4+) and fours without (4-) and the eight (8+), which always carries a coxswain. The eight is the fastest boat on the water. A world-level men’s eight is capable of moving almost 14 miles per hour. Athletes are identified by their seat in the boat. The athlete in bow is seat No. 1. That’s the person who crosses the finish line first (which makes it easy to remember – first across the line is No. 1 seat). The person in front of the bow is No. 2, then No. 3, No. 4, No. 5, No. 6, No. 7 and No. 8, a.k.a. the stroke. 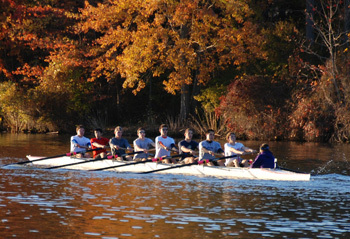 The stroke of the boat must be a strong rower with excellent technique, since the stroke sets the rhythm and number of strokes per minute and the rest of the crew must follow. An athlete of any weight can enter the open categories, although the average woman in an open race will approach 6′ in height and an average open weight man 6’6″. Lightweight Men cannot weigh more than 160 pounds and the average weight in the entire boat cannot exceed 155 pounds. Lightweight Women cannot weigh more than 130 pounds. There is no averaging weight for women’s boats in the United States. An athlete who does not turn 19 in the current calendar year or is still enrolled in a secondary school is classified as a Junior. Under-23 is as the name applies, a rower who has not reached 23 years of age. In rowing, an athlete officially becomes a Master the year they turn 27, however many regattas offer a newer Masters category that requires a person to be 21. The Masters events are frequently broken down into age subcategories which are assigned letter designations with current top age category J composed of rowers who are 80 years old and older. Athletes of any age can row in an open event. International and most United States races are 2,000 meters in length, or approximately 1.25 miles. There are still some Juniors races that are run on a 1,500 meter course. The racecourse is divided into six lanes and each 500-meter section is marked with buoys. The race begins with all boats aligned at the start in the lanes they’ve been assigned. Individuals in each lane hold the stern of each boat steady while an official, known as the aligner, ensures that each boat is even with the others and squarely facing the course. Each crew is allowed one false start; two means disqualification. If within the first 100 meters there is legitimate equipment breakage (e.g., an oar snaps in two), the race will be stopped and restarted with repaired equipment.The stroke rate (the number of rowing strokes per minute that a crew is taking) is high at the start – maybe 45 to even 50 for an eight; 38 to 42 for a single scull. Then, the crew will “settle” into the body of the race and drop the rating back – 38 to 40 for an eight; 32-36 for a single. The coach and the way the race is going determine when the crew will sprint but finishing stroke rates of 46+ in the last 200 meters aren’t unheard of. However, higher stroke rates are not always indicative of speed. A strong, technically talented crew may be able to cover more water faster than a less-capable crew rowing a high stroke rate. Unlike canoe/kayak competitions, rowers are allowed to leave their lanes without penalty, so long as they do not interfere with anyone else’s opportunity to win. An official follows the crews to ensure safety and fairness. Despite the exhaustion of the race, the crew will row for five to 10 minutes afterwards in order to cool down. In rowing, the medals ceremonies include the shells. The three medal-winning crews row to the awards dock, climb out of their shells and receive their medals before rowing away. The stroke is made up of four parts: Catch, Drive, Finish and Recovery. As the stroke begins, the rower is coiled forward on the sliding seat, with knees bent and arms outstretched. At the catch, the athlete drops the oarblade vertically into the water. At the beginning of the drive, the body position doesn’t change – all the work is done by the legs. As the upper body begins to uncoil, the arms begin their work, drawing the oarblades through the water. Continuing the drive, the rowers move their hands quickly into the body, which by this time is in a slight “layback” position, requiring strong abdominal muscles. During the finish, the oar handle is moved down, drawing the oarblade out of the water. At the same time, the rower “feathers” the oar – turning the oar handle – so that the oarblade changes from a vertical position to a horizontal one. The oar remains out of the water as the rower begins the recovery, moving the hands away from the body and past the knees. The body follows the hands and the sliding seat moves forward, until, knees bent, the rower is ready for the next catch. 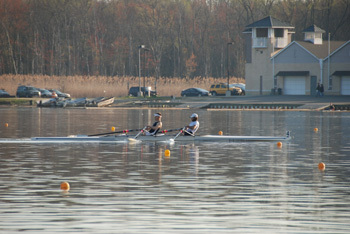 In the fall, crews race a different type of race called a Head Race. Head Races can be of various lengths and involve the crews starting individually at set time intervals. The crews try to catch up to the crew starting in front of them while avoiding being passed crews starting behind them. Time penalties can be given if one crew interferes with another crew. The crew with the quickest time is declared the winner. 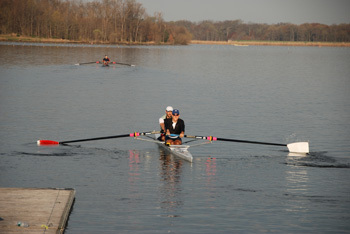 Head races frequently involve courses with turns making the coxswain’s job much more difficult. Oars move the boat through the water and act as balancers. Sweep oars are longer than sculler’s oars. The shaft of the oar is made of extremely lightweight carbon fiber instead of the heavier wood used years ago. The popular “hatchet” blade – named because of its cleaver-like shape – is about 20 percent larger than previous blades. Its larger surface area has made it the almost-universal choice among world-level rowers. All rowing boats can be called shells. Rowing boats with scullers in them (each person having two oars) are called sculls, e.g., single scull, double scull, quadruple scull. So, all sculls are shells but not vice versa! Originally made of wood (and many beautifully crafted wooden boats are made today), newer boats – especially those used in competition – are made of honeycombed carbon fiber. They are light and appear fragile but are crafted to be strong and stiff in the water. The smallest boat – the single scull – is approximately 27 feet long and as narrow as 10 inches across. At 60 feet, the eight is the longest boat on the water. The oars are attached to the boat with riggers, which provide a fulcrum for the levering action of rowing. Generally, sweep rowers sit in configurations that have the oars alternating from side to side along the boat. But sometimes, most typically in the 4- or 4+, the coach will rig the boat so that two consecutive rowers have their oars on the same side in order to equalize individual athlete power. Crews are identified by their oarblade design. Baron Pierre de Coubertin, founder of the modern Olympics, was a rower. Rowers were the third largest U.S. delegation (48 athletes) to the Olympic Games in 2000. Eight-oared shells are about 60-feet long – that’s 20 yards on a football field. Rowing was the first organized team sport contested in the United States. The longest running U.S. athletic competition, the rowing race between Harvard and Yale, was first contested in 1852. An eight, which carries more than three-quarters of a ton (1,750 pounds), may weigh as little as 200 pounds. The boats are made of fiberglass composite material. Singles may be as narrow as 10 inches across, weigh only 23 pounds, and stretch nearly 27-feet long. The first rowing club in the U.S. was the Detroit Boat Club, founded in 1839. From 1920 until 1956, the USA won the gold medal in the men’s eight at every Olympic Games. The first national governing body for a sport in the United States was for rowing. Founded as the National Association for Amateur Oarsmen in 1872, it was changed in 1982 to the United States Rowing Association. Yale College founded the first collegiate boat club in the U.S. in 1843. FISA, the first international sports federation, was founded in 1892. Dr. Benjamin Spock, the famous baby doctor, was an Olympic rower in 1924 and won a gold medal in the eight. Gregory Peck rowed at the University of California in 1937. From the television show House, Actor Hugh Laurie was a world class rower. Physiologists claim that rowing a 2,000-meter race – equivalent to 1.25 miles – is equal to playing back-to-back basketball games.